We arrived in Pemba in the remote north of Mozambique 13 years ago. It was a dishevelled, run-down remnant of a former Portuguese colonial city...in some ways reminiscent of Maputo when we first went there with Iris in the late-90s. People were very poor; there were very few vehicles on what passed for roads; and most children were not attending school. The gospel was virtually unknown; and witch doctors and demon worship were rife. The changes we've witnessed over that time have been truly amazing. Natural resource development and tourism have fuelled dynamic economic growth and the city is being transformed from the ground up. Most children are now in school (though secondary school enrolment is still restricted to the academically and economically privileged few). Iris has made a major impact on the city spiritually and economically...though our presence is an unwelcome challenge to some of the older religious traditions in the region. There is still terrible poverty among the poor...and especially in the rural villages. And the corruption endemic in the powerful ruling elite is generally preventing the poor from benefitting from the economic recovery. Our work has involved providing protection, provision and opportunity for children the Lord has added to our Mieze and Noviane families...including many village children we are supporting through IMC's "Stop for the One--Canada" Sponsorship Program. About 145 children are currently being cared for; and the Father's love has opened for them unprecedented opportunities for their future. 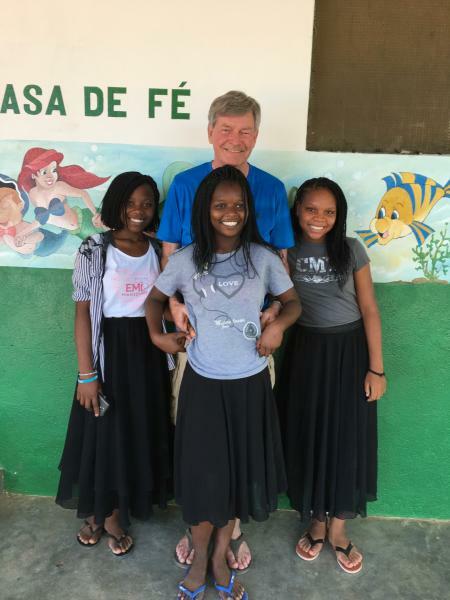 The attached picture shows Don with three of our secondary school students in front of one of the newly-decorated children's homes in Mieze. These girls are from extremely disadvantaged backgrounds, economically and socially. But today they are happy, healthy and filled with gratitude to the Lord for giving them "hope and a future (Jer. 29:11)."